We've added some new features and improved existing ones. Recently we have upgraded our live availability map by adding new features and improving some existing ones. Based on user feedback we have made the map more user friendly and now provide more information that makes it easier for EV drivers to charge. We hope that this will make it easier for users to locate POD Points and successfully initiate charge cycles! a) New Feature: Pin ‘clustering’ - Before we had so many Points on the map it was sometimes difficult to see the map behind! 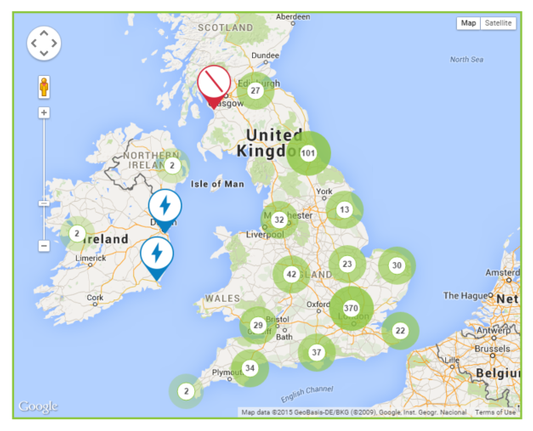 To solve this we’ve ‘clustered’ our pins to show you the number of chargepoints near one another, in a region. a) New Feature: Last used date - You can see if others have successfully charged recently on a given Point indicating it’s reliability. a) Improved Feature: Three Clear Statuses to keep things simple! (Available, Charging or Offline). - Quickly see if a Point is available for use. a) New feature: Users can now see the connector type and power rating for any given unit. - Quickly see if your EV is compatible and check it will charge at the speed you want. Over the last few months we have built up a dedicated mapping team. They are working on consolidating the information we currently have about POD Points listed on our map and making sure all future information is as accurate and relevant for users as possible. The mapping team have plenty more innovations up their sleeves, stay tuned for more soon!